Select attendees include Alec Baldwin, Karen Allen, Amber Tamblyn, Mary Stuart Masterson, Alia Shawkat, Lori Singer, Chris Noth, Josh Charles, Melissa Leo, Catherine Hardwicke, Bette Gordon, Roger Ross Williams, Ricki Stern, Annie Sundberg, Todd and Jedd Wider, Sam Pollard, John Sloss, William Horberg, Richard Abramowitz, Boston Marathon bombing survivors Celeste and Sydney Corcoran, Combatants for Peace activists Mohammed Owedah and Assaf Yacobovitz, and many others. WORLD CINEMA with Special Focus on Dutch Cinema, featuring 32 international films, including NERUDA, directed by Pablo Larraín, starring Gael García Bernal and Luis Gnecco. SPOTLIGHT ON WOMEN will feature 44 female directors who will present their work (a third of the festival’s offerings!) including the North American Premiere of Bette Gordon's THE DROWNING, starring Josh Charles, Julia Stiles and Avan Jogia. The Tangerine Juice Award will be presented for best first, or second-time female director. FOCUS ON MUSIC will spotlight films featuring music of diverse genres, including the New York Premiere of AMERICAN EPIC, executive produced by Robert Redford, T Bone Burnett, Jack White, and featuring Nas, Elton John, Alabama Shakes, Steve Martin, Taj Mahal, Ana Gabriel, Ashley Monroe, Willie Nelson, and Merle Haggard. Woodstock, NY (September 12, 2016) - The fiercely independent 17th Annual Woodstock Film Festival presents an outstanding lineup of films to be shown in Woodstock, NY, as well as Rhinebeck, Rosendale, Saugerties, and Kingston. 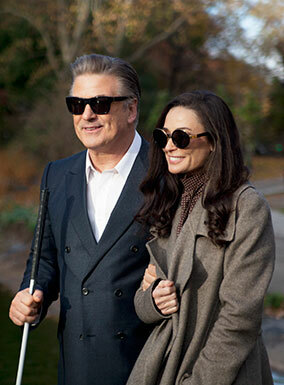 The festival opens on Oct. 13 with the World Premiere of BLIND, a romantic narrative feature written by John Buffalo Mailer and starring Alec Baldwin (who will attend the screening with director Michael Mailer) and Demi Moore. The Opening Night Film screens at 6 p.m. Oct.13 at the Woodstock Playhouse. Since its inception in 2000, the Woodstock Film Festival firmly established itself as one of the foremost regional independent film festivals, breaking new ground for the influx of festivals, offering a unique platform for talented emerging and established filmmakers and quickly being named among the top 50 film festivals worldwide. "It's a great festival,” said past participant, actor Paul Rudd. “It's what a film festival should be, which is really independent films showcasing the work of filmmakers you might not know about... I can't think of another place that seems better suited to have an independent film festival than Woodstock." This year the festival presents a curated offering of the best films selected from more than 2,000 entries from around the globe. Countries represented in this year’s films are Chile, China, The Faroe Islands, France, Israel, Italy, Netherlands, Palestine, South Africa, Spain, Sweden,Trinidad, Tobago, Ukraine, United Kingdom and the USA. Over 90% of the films in the lineup will be screened with the filmmakers and cast/subjects in attendance. Tickets for the Maverick Awards Ceremony, and program updates are available online at woodstockfilmfestival.com. 2016 Narrative Features hail from all corners of the world. This year the festival offers romance, mystery, comedy and horror narratives to stretch our emotions and world view. With a pallet of returning soldiers, blind lovers, halfway house residents, poets and mad inventors, the full range of human experience is found in this year’s offerings. 2016 DOCUMENTARY FEATURES represent diverse voices of culture and span a wide range of topics and issues, from the history of recorded American music to civil rights, whaling, mental health and black market adoption. Prepare to have your world view challenged and expanded through these thought-provoking documentaries. Woodstock Film Festival screens some of the most exciting films of the shorts genre, packing big messages in small spaces. This year’s shorts are bundled into topic categories that include Animation with Joy + Noelle; Carbon; Instinct; Jests; Outsiders; Passion; Short Docs; Whispers and Youth Films. A Nearly Perfect Blue Sky, directed by Quarxx; The ABC of Travel, directed by Signe Baumane; Adam directed by Evelyn Jane Ross; Afuera, directed by Steven Liang; Baby Teeth directed by Stephanie Ellis; Behind the Schoolbag, directed by Nic Ho Chun Yu; Black Canaries, directed by Jesse Kreitzer ; Bone Guitar, directed by Payton Curtis; Borrowed Time, directed by Lou Hamou-Lhadj and Andrew Coats; Cacophony, directed by Melody Aihsuan Shih; The Chop, directed by Lewis Rose; Club Policy, directed by New Media Ltd; Cookies, directed by Leah Shore; Cop Dog, directed by Bill Plympton; Cracked, directed by Benny Rendell; Cuddle Party, directed by Matthew Irving Epstein; Day By Day, directed by Nihal Dantluri; Domar: To Tame, directed by Benjamin Ades; Ed, directed by Taha Neyestani; Filthy but Fine, directed by Arthur Metcalf; For Your Own Safety, directed by Florian Heinzen-Ziob; Graffiti, directed by Lluis Quilez; He, She, directed by Maia Liebeskind ; How You Look at It, directed by Wendy Seyb; La Laguna, directed by Aaron Schock; The Last Night of the World, directed by Harrison O'Clair; Leonarda, directed by Luca Brinciotti; Listen, directed by Benny Rendell; Look-See, directed by Daniel Savage; Madhab, directed by Samay Bhattacharya; Makeshift Satellite, directed by Cody Walzel; Marquis, directed by Maya Suchak; Nasty, directed by Prano Bailey-Bond; New York Nocturne, directed by Richard Edson; Nuts, directed by Theo Sena; One Day on Carver St., directed by Azure Allen; Opus 40, directed by Glenn Schuster and Jason Schuler; Patti Smith Blank on Blank, directed by Patrick Smith; Perched, directed by Liam Harris; Perfect Houseguest, directed by Ru Kuwahata and Max Porter; Pickle, directed by Amy Nicholson; Porgies & Bass, directed by Thomas Barnes; Potatoes For Pado, directed by Joy Buran and Noelle Melody; The Quantified Self, directed by Gleb Osatinski; The Rain Collector, directed by Isabella Wing-Davey; Rated, directed by John Fortson; The Sea is Blue, directed by Vincent Peone; Serendipity: The Genius Behind Electric Lady, directed by Alyssa DeRosa, Catherine Kaczor, Alec Cafaro, and Meagan Sullivan; Shame, directed by Paul Hunter; Sisters, directed by David Chontos; Slow Wave, directed by Andy Kennedy; Spiral, directed by Tatum Lenberg; The Dynamic Double Standard, directed by Luke Patton; The Story, directed by Carolyn Pender and Cameron Dingwall; Striking a Chord: Instruments of Healing, directed by Susan Rockefeller; Suffering is the Easy Part, directed by Jaime Ekkens; There’s Too Many of These Crows, directed by Morgan Miller; Wake O Wake, directed by Hilary Brougher; Water!, directed by Yi Zhong. The annual Maverick Awards Ceremony has become one of the most talked-about events attracting more than 500 filmmakers, industry professionals and community leaders and guests. The event is open to the public. Individual and full-table tickets are available at the Woodstock Film Festival Box Office or online. Best Feature Narrative, Best Feature Documentary, Best Short Narrative, Best Short Documentary, Best Animated Short, the James Lyons Editing Award (Documentary and Narrative), the Haskell Wexler Award for Best Cinematography, the Tangerine Entertainment Award for Best Female Director, the Ultra Indie Award, the Carpe Diem Andretta Award and the World Cinema Award. Audience awards are announced to the media on Sunday.